During the 2014 International Railway Conference in Copenhagen, Torsten Nielsen, a recent graduate from TUM Asia, was awarded the ‘Best Student Project 2014’ for his outstanding Master Thesis work. Originally from Denmark, Torsten returned to Copenhagen to carry out his internship after completing his coursework in the Master of Science in Transport & Logistics in Singapore. Torsten’s thesis was based on his internship with Ramboll DK, where he worked on the largest Danish railway project that involved upgrading the line to reduce travel time. Using alternative methods of optimizing the Danish way of performing speed upgrades coupled with diverse methods used in other countries, Torsten ensured that the knowledge used for these projects were up to date. His thesis also involved implementing alternative transition curves onto the train tracks, while making slight adjustments to tilt the trains. These minor adjustments can traverse the curve at a velocity approximately 30% higher than a conventional train. This would ultimately speed up the trains, greatly reducing the travel time for many passengers. 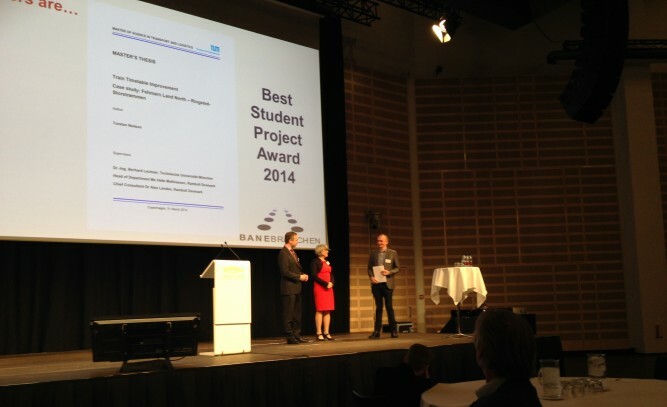 The ‘Best Student Project 2014’ award was presented by the Danish Rail Sector Association. All the best theses are read by a jury of railway experts from various companies in Denmark. The winner was announced during the opening ceremony of the annual railway conference in Copenhagen. This year, 570 experts participated in the competition. To find out more about Torsten’s achievement, read our interview with him on the July-September 2014 issue of our newsletter.